In all fairness, Prophet (SAW) did not rebuke/scold him because he was a Bedouin – an illiterate person who was ignorant of the fact that one must not interrupt the khutbah. So instead, Prophet (SAW) just did as he said – he made du`a for rain. Once in the lifetime of the Prophet (p.b.u.h) the people were afflicted with drought (famine). While the Prophet was delivering the Khutba on a Friday, a Bedouin stood up and said, “O, Allah’s Apostle! Our possessions are being destroyed and the children are hungry; Please invoke Allah (for rain)”. So the Prophet raised his hands. At that time there was not a trace of cloud in the sky. By Him in Whose Hands my soul is as soon as he lowered his hands, clouds gathered like mountains, and before he got down from the pulpit, I saw the rain falling on the beard of the Prophet. It rained that day, the next day, the third day, the fourth day till the next Friday. The same Bedouin or another man stood up and said, “O Allah’s Apostle! The houses have collapsed, our possessions and livestock have been drowned; Please invoke Allah (to protect us)”. So the Prophet raised both his hands and said, “O Allah! Round about us and not on us”. So, in whatever direction he pointed with his hands, the clouds dispersed and cleared away, and Medina’s (sky) became clear as a hole in between the clouds. The valley of Qanat remained flooded, for one month, none came from outside but talked about the abundant rain. During the 6th year of the Prophet’s migration to Madinah, people complained to him about lack of rain, so he gave orders for a pulpit to be prepared. Finally, he faced the people, descended from the pulpit, and prayed twice in rak’at (prostration). as soon as he finishes the khutbah, the people present should turn their outer garments around, each placing its left side on his right side and its right side on his left, face the qiblah (Ka’ba), supplicate Allah and raise their hands while doing so. About turning the rida’ (cloak/upper garment) inside out, this here should be helpful. There has been a post on this topic before, but this will be more detailed and insightful inshaAllah. One of the etiquettes of visiting the Masjid, is the offering of two rak`aat glorifying Allaah upon arrival. 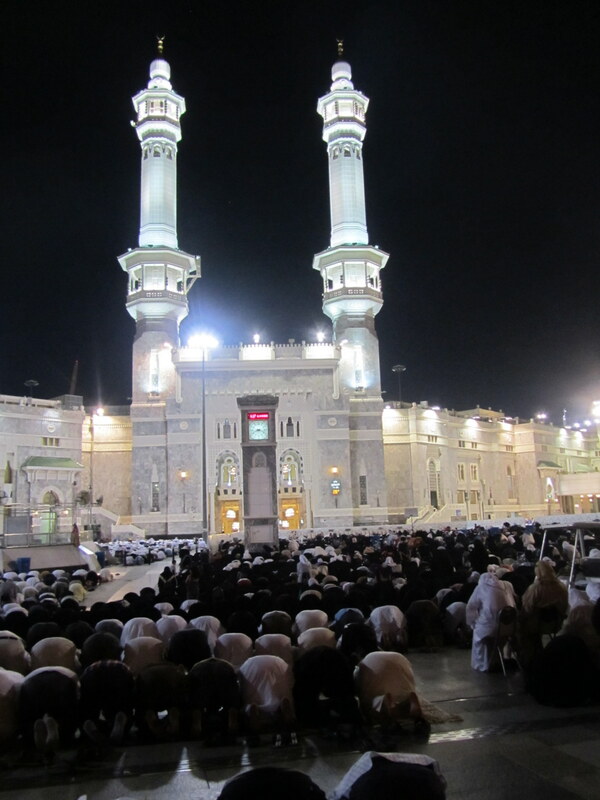 These two rak`aat show honor and respect for the places of worship. These two rak`aat are known as “Tahiyyaht-ul-Masjid”, and display salutation for the masjid. The person entering the masjid performs them greeting the masjid; similar to the way a person greets somebody. In the Ahadith mentioned above (top), an instance is mentioned where Prophet (SAW) interrupts his khutba to ask a man if he had prayed tahiyyat-ul-masjid upon entering the masjid. And then he ordered him to get up and pray the two rak`aat. This is where the confusion starts. 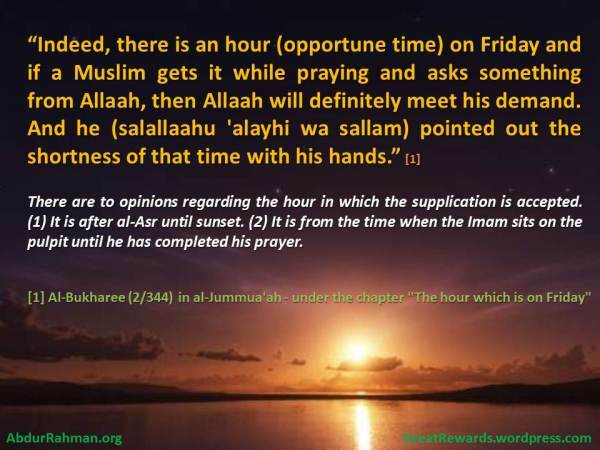 Is the Jumu`ah khutba more important or the tahiyyat-ul-masjid? Well, read point 4 here. Is it mandatory, recommended, or just a voluntary deed? Does a person HAVE to perform these two rak`aat upon entering a masjid, or does he/she have an option? Well, there’s difference of opinion among scholars. Go through this link for details. In short, it is recommended and a “stressed Sunnah”. So if it’s a stressed Sunnah, can we perform the two rak`aat even in the times when prayer is forbidden (example: after Fajr, after Asr)? Get your answer here. And what do you think about those who reach the masjid after the Imaam comes out? 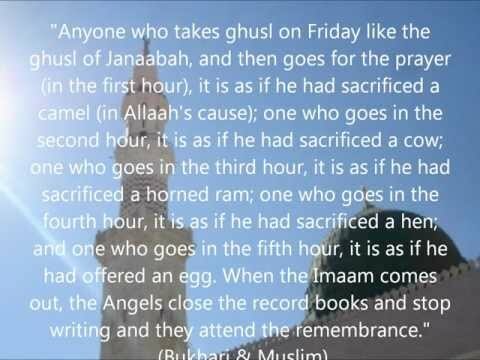 Even angels leave their jobs at that time to listen to the khutbah! This is about the Friday Khutbah..
See the Imaam, he's standing at a raised position (minbar) to deliver the khutbah. This is Sunnah of the Prophet (SAW). One of the reasons may be to help maximum people listen to the khateeb and second, the khateeb can keep an eye on the listeners. A little more on the Khutbah Scene here and here.